Goodness! I have not posted in six weeks. Life got a little hectic, between parish, some health issues, and then my father’s physical decline. He fell asleep in the Lord on November 14 and I was able to celebrate his Mass of Christian Burial on the 17th, at Saint John the Baptist Church in Kenmore, NY. He was 94, would have been 95 on December 9th. An interesting point to ponder: who comes to mourn a man of that age, who has outlived nearly all of his contemporaries? Well, if you have lived well and cared for others, it turns out a couple hundred people came to the wake, where we spent four hours with a nonstop line of mourners, and again at the church and cemetery. We heard many good stories of his actions on behalf of other people, and the importance he placed on doing the right thing. As we prepare for the Birth of Christ, it is worth asking ourselves, what will my legacy be as a follower of Christ? Today is the feast of St. Francis Xavier on the Roman calendar. He is probably the most prolific missionary in the history of the Catholic Church, covering territory from western India to Japan. A gifted linguist, this Basque co-founder of the Jesuits was also blessed at least twice with the gift of tongues, when diverse people heard him preach in their own languages at Travancore (India) and Amaguchi (Japan). God granted many miracles in answer to Xavier’s prayers, and after his death – he died waiting to enter China in 1532 – the various Catholic communities founded by him reported a plethora of miracles that were sent to Rome for study. Why do I like him so much? My home parish of Saint John’s in Kenmore is one of the two churches where the annual Novena of Grace is preached every March (the other being Saint Michael in downtown Buffalo). I served the novena Masses or attended all through grammar school and high school. The novena was so popular in Buffalo that it occasionally showed up on the evening news on television. And as an Eastern Catholic, it is great to record that unlike so many missionaries and soldiers who followed in his wake, he accepted the ancient Syriac Church of India as solidly orthodox in faith. Had his example been followed by the Portuguese churchmen who devastated that Church in the 1500s and 1600s, the Christian history of India would have been much better. Instead they launched a violent purge, destroying ancient manuscripts, Latinizing the liturgy and sacraments almost beyond recognition, and breaking the Syriac Church’s ties with the mother Church in Iraq. Tens of thousands broke with Rome as a result, and the Syriac-Malabar Catholic Church was forbidden to conduct Catholic missionary work in India, despite it being of apostolic origin* and well adapted to Indian life. The Malabar Catholics were only allowed to preach the Gospel to non-Christians after Vatican II! 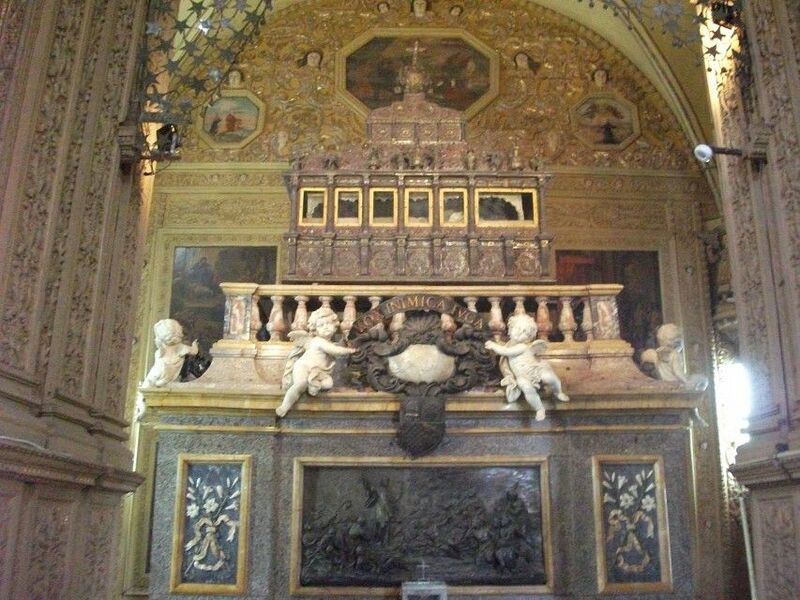 Saint Francis Xavier’s body reposes today in Bom Jesus basilica in Old Goa, the city where he first landed in India. He remains very popular in Asia, where his many miracles of his lifetime are well-known. As persecution of Christianity intensifies in India – and other Asiatic countries – may his prayers bring about many blessings for the faithful! *The Syriac Churches of India all trace their founding to the work of Saint Thomas the Apostle, whose tomb lies in Chennai, India. Excavations of the tomb found not only items that matched the ancient stories of the apostle, but brickwork done in the style of first-century Rome. There was a steady trade between western India and the Roman Empire using the trade winds of the Indian Ocean.